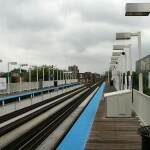 The 47th Street station was built as part of the South Side Rapid Transit’s extension to the Columbian Exposition in 1892. 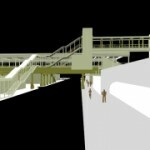 The original station building was a grade-level structure that resembled other stations built as part of the extension. The original brick and stone station house, designed by architect Myron H. Church, was designed with a Queen Anne-style influence. 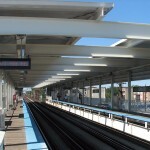 At a cost of over $1 million, the station was to received a new platform and canopy and a new station house in the early 1980’s. 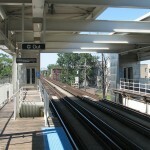 In 1994, the Green Line closed for a two-year rehabilitation. 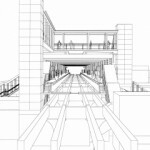 All stations on the line, including 43rd, closed for renovation. 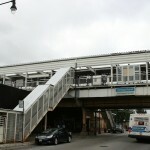 This elevated train station platform renovation included handicap access and the ability to cross from one side of the station as well as a light rehabilitation of the station platforms. 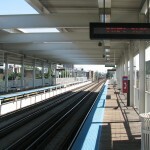 The station re-opened in 1996. Images and description courtesy of www.chicago-l.org and www.transitchicago.com Architectural work completed by Brian Rich at Daniel P. Coffey & Associates, Ltd.